By Ann-Christine Diaz . Published on October 21, 2016. Facebook has its users to thank for its first campaign promoting Facebook Live, a top priority for the company. The social media platform has used content created by its own community in a series of quirky vignettes designed to show others what the product is about. Each film counts down "3, 2, 1" and then follows with a cute, live moment, mined from Live videos that real users have posted publicly. One shows an adorable, wide-eyed boy bracing for his first haircut, for example. In another, a seemingly innocuous mountain of stuffed animals offers up a surprise when one of the "toys" lifts its head -- revealing a dog in a teddy bear outfit. Friends' emojis and comments then adorn the screen. 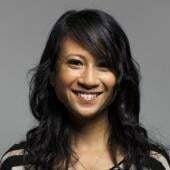 "It's still relatively young for us, but it's been a hit," said Rebecca Van Dyck, VP-marketing at Facebook. Since Facebook Live entered wide release in April, those broadcasting live at any minute has quadrupled. The platform has also seen broadcasts from all seven continents -- as well as from outer space. "Drafting off of that energy, we're doing a campaign in the U.S. and the U.K," Ms. Van Dyck said. "The intent is to educate and to inspire people to go live with their friends." The company's research showed that while people were aware of Live, "when it came to actually trying it themselves, there are some barriers there," she said. The brand set out to address those barriers in a two-phase push focusing on awareness and education. The first ads are part of the "awareness" phase and are accompanied by out-of-home ads including a massive, multi-screen installation broadcasting "3,2,1" moments simultaneously. The education segment consists of a series of tutorials that demonstrate how simple it is to go "live," centered around themes such as showing off a hidden talent or getting something off your chest. Clever, contextual outdoor ads try to entice people to use the product right on the spot. 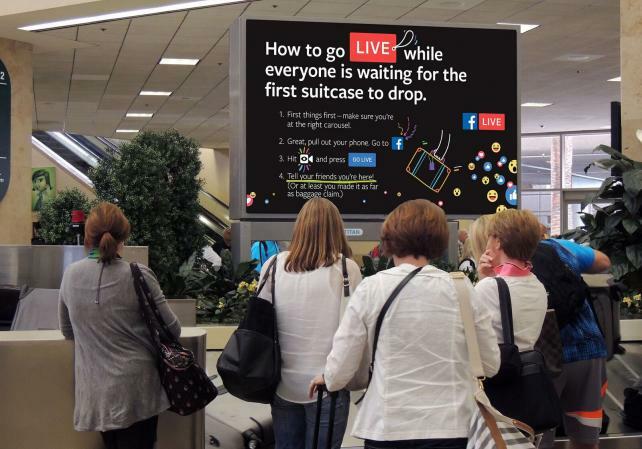 A bus shelter ad, for example, reads, "How to go live when you see someone walking an animal that's not a dog," while one ad sitting above an airport luggage carousel displays, "How to go live while everyone is waiting for the first suitcase to drop." Created out of Facebook's in-house agency The Factory, the campaign debuts with the awareness ads in the U.K. this Sunday and in the U.S. on Monday, while the tutorial phase will begin running on Monday, November 7. More than 20 vignettes and tutorials will feature on TV and digital. All the content used in the ads, from video to photos, was shot on Facebook Live on phones. None of it was scripted. "The approach here was to authentically express the product," said Facebook VP-Executive Creative Director Scott Trattner. "For us, what felt like the right thing to do was just observe and see what people who were using the product were doing with it. In many ways the way people were using it was more inspiring than anything we could have written." The team had sifted through the Facebook Live Map, which allows users to see the Live videos made around the world. "We really were all over that finding the best moments of people using the product, and essentially, what we did was take those assets and turned them into TV commercials," he said. The creators were compensated for allowing their films to be in the ads, he added. "What users were already doing "gave shape to the campaign and the way we ideated around it," Mr. Trattner said. "The community was already using it, and we're shining a light on that."